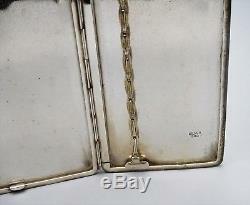 OLD STERLING SILVER 950, JAPANESE CIGARETTE CASE, ARTIST SIGNED. 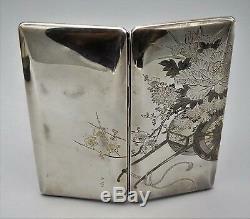 GORGEOUS, LARGE AND HEAVY JAPANESE ARTIST SIGNED CIGARETTE CASE IN 950 SILVER. 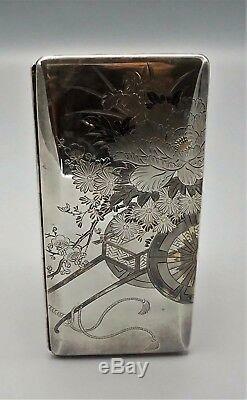 HAND CHASED AND DECORATED IN TRADITIONAL JAPANESE DESIGN DEPICTING A CARRIAGE AND ROPE, WITH FLOWERS, TREE BRANCHES. The CASE is approximately 3 AND 1/4 inches ACROSS and 6 ½ inches LONG. Both parts are marked with: SILVER, 950. Please see pictures for marking details. This item IS IN VERY GOOD TO EXCELLENT condition, some surface scratches, a few micro dings, few small dents, commensurate with its age. Please see pictures for details. Thanks for viewing my auctions. I do my best to take good photographs of each item. However, please keep in mind that different monitor quality and setting may create color tune difference on some colors. The age of items offered is just a rough estimate. 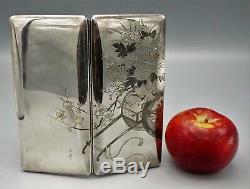 The item "OLD STERLING SILVER 950, JAPANESE LARGE CIGARETTE CASE, ARTIST SIGNED" is in sale since Sunday, December 3, 2017. This item is in the category "Antiques\Silver\Sterling Silver (. 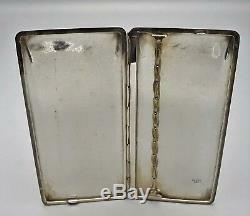 925)\Cigarette & Vesta Cases". The seller is "erecc6" and is located in Belleville, New Jersey. This item can be shipped to United States, Canada, United Kingdom, Denmark, Romania, Slovakia, Bulgaria, Czech republic, Finland, Hungary, Latvia, Lithuania, Malta, Estonia, Australia, Greece, Portugal, Cyprus, Slovenia, Japan, China, Sweden, Indonesia, Taiwan, South africa, Belgium, France, Hong Kong, Ireland, Netherlands, Poland, Spain, Italy, Germany, Austria, Israel, Mexico, New Zealand, Philippines, Singapore, Switzerland, Norway, Saudi arabia, Ukraine, United arab emirates, Qatar, Kuwait, Bahrain, Croatia, Malaysia, Brazil, Chile, Colombia, Bahamas, Viet nam, Uruguay, South Korea, Thailand, Bermuda, Egypt.